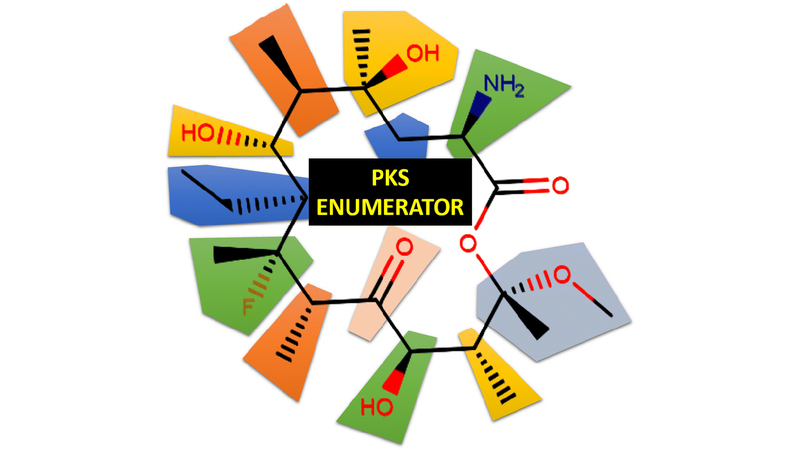 PKS Enumerator software generates new macrolides by permuting key chemical building blocks. Researchers from North Carolina State University have created the largest publicly available virtual library of macrolide scaffolds. The library – called V1M – contains chemical structures and computed properties for 1 million macrolide scaffolds with potential for use as antibiotics or cancer drugs. One way that chemists utilize computers is by using them to enumerate, or virtually generate, new molecules and compare their predicted properties to those of existing drugs. This in silico screening process quickly and inexpensively identifies compounds with desirable properties that experimental chemists can then synthesize and test. Macrolides are a family of chemicals mainly used as antibiotics and anti-cancer drugs. Their unique ring structure enables them to bind to difficult protein targets. Some of them are considered drugs of last resort, especially for drug-resistant bacteria. Fourches and his colleagues created a computer software program called the PKS Enumerator, which generates very large libraries of virtual chemical analogues of macrolide drugs. The software uses chemical building blocks extracted from a set of 18 known bioactive macrolides, breaking each one down into its component chemical parts, and then reshuffling them to create new compounds according to a series of rules and user-constraints. The resulting library of new macrolides – V1M – classifies the new compounds by size, weight, topology and hydrogen bond donors and acceptors. The research appears in the Journal of Cheminformatics. NC State graduate student Phyo Phyo Kyaw Zin is first author. Gavin Williams, associate professor of chemistry at NC State, also contributed to the work. We report on the development of a cheminformatics enumeration technology and the analysis of a resulting large dataset of virtual macrolide scaﬀolds. Although macrolides have been shown to have valuable biological properties, there is no ready-to-screen virtual library of diverse macrolides in the public domain. Conducting molecular modeling (especially virtual screening) of these complex molecules is highly relevant as the organic synthesis of these compounds, when feasible, typically requires many synthetic steps, and thus dramatically slows the discovery of new bioactive macrolides. Herein, we introduce a cheminformatics approach and associated software that allows for designing and generating libraries of virtual macrocycle/macrolide scaﬀolds with user-deﬁned constitutional and structural constraints (e.g., types and numbers of structural motifs to be included in the macrocycle, ring size, maximum number of compounds generated). To study the chemical diversity of such generated molecules, we enumerated V1M (Virtual 1 million Macrolide scaﬀolds) library, each containing twelve common structural motifs. For each macrolide, we calculated several key properties, such as molecular weight, hydrogen bond donors/acceptors, topological polar surface area. In this study, we discuss (1) the initial concept and current features of our PKS (polyketides) Enumerator software, (2) the chemical diversity and distribution of structural motifs in V1M library, and (3) the unique opportunities for future virtual screening of such enumerated ensembles of macrolides. Importantly, V1M is provided in the Supplementary Material of this paper allowing other researchers to conduct any type of molecular modeling and virtual screening studies. Therefore, this technology for enumerating extremely large libraries of macrolide scaffolds could hold a unique potential in the ﬁeld of computational chemistry and drug discovery for rational designing of new antibiotics and anti-cancer agents.